Le Professeur Claude Jacques, éminent épigraphiste, left us on 20th of last February in his 89th year. He joins the line of the great masters who were his mentors: George Cœdès, Louis Dumont, Jean Filliozat, Paul Mus, Louis Renou. A member of the EFEO from 1963 to 1973, and then Director of Studies at the EPHE, Claude Jacques continued to teach up until 2010, long after his retirement. The work of Claude Jacques is inscribed in the continuity of the epigraphic and historic works of George Cœdès, extending their scope as regards questions of monumental chronology and urban development with particular interest in archaeological and architectural works towards clarifying the numerous shady areas that punctuate Kmer civilisation. And this is aside from the academic output that made him an authority on matters pertaining to epigraphy and history,Claude Jacques knew how to compose works of popularisation and produced several works that have become classics. Over the last thirty years, Claude Jacques was also passionately involved in the renaissance of Angkor, participating in all the efforts made in this endeavour, from the first exploratory missions in 1989 to the many sessions of the International Committee of coordination for the safeguarding and development of the Angkor site as special counsellor to the Director General of UNESCO, Federico Mayor. On 29th June of last year, His Majesty King Norodom Sihamoni, king of Cambodia, conferred on Claude Jacques the honour of the Grand-Croix de l'Ordre Royal du Sahamétrei, in recognition of his contribution to Khmer history and culture.As well, Claude Jacques was a savant, always on the lookout for new discoveries and with an ear to the ground and to researchers, especially those of the EFEO for whom he had a particular affection. He was eager for information about what the new generations were finding out at Angkor, and always ready to find subjects for reflection in that, as much towards questioning some of his hypotheses as towards confirming them. He was a professor, esteemed for his pleasant and benevolent personality, his fine and alert mind and for being an especially appreciated colleague. L'EFEO offers sincere condolences to his family and those close to him. Yves Goudineau, ethnologist of South-East Asia, and Director of the EFEO since 2014, gave up the directorship on 27th February this year. Christophe Marquet, historian of Japanese art, and Director of Studies at the EFEO, took over the duties of the Director of the institution on 1st March. Christophe Pottier, architect, and maître de conférences at the EFEO was appointed Director of Studies as of 1st March. Christophe Marquet, Director, is in Peking from 18th to 23rd March, to participate in events organised on the 20th anniversary of the EFEO Centre (at the Institute of History and Natural Sciences of the Chinese Academy of Sciences), and in the seminar “Max Weber and China”, organised by the Max Weber Stiftung. He meets its director, Pr. Hans van Ess, as well as the French ambassador, with a view to discussions on the FrDnco-German collaboration in China and the future of the EFEO Centre. Christophe Marquet, Director, at Paris on 29th March, meets Pr. Itô Nobuhiro (University of Nagoya) Pr. Sasaki Takahiro (University of Keiô) for research on the ancient Japanese books in French collections and the setting up of a workshop on Japanese paleography, in the framework of the Japanese ANR project “Building a network in Europe through cutting edge research on Japanese picture books from the late Muromachi to Edo periods, Nara ehon, and Edo period illustrated manuscripts” (2017-2020) of which he is an associate. Christophe Pottier, Director of Studies, gives a presentation on “Recherches sur les premières cités dans la région d'Angkor” at the Assembly General of the Association des Amis d'Angkor, held on 5th March at the Maison de l'Asie. Christophe Pottier gives two lectures 7th March on “Cartographie archéologique et études urbaines à Angkor” in the framework of the Master 1 Archéologie de l'Extrême-Orient and 23rd March on “Patrimonialisation(s) à Angkor:entre reconstruction coloniale et appropriation identitaire”, in the framework of the Licence of history of art, Management of works and sites, Paris-Sorbonne. Alain Arrault presides over the committee of evaluation HCERES of EA ASIEs and CEJ of INALCO, and of the project UMR IFRAE (Institut français des recherches sur l'Asie de l'Est, INALCO-Université Paris Diderot-CNRS), on 7th March in the premises of INALCO, rue de Lille. Pierre-Yves Manguin on 20th to 30th March is in Kochi (Kerala, India) to participate in the Conference On Indian and Pacific Maritime Traditions. Yves Goudineau et Dang Nguyen Anh, vice-président de la Vietnam Academy of Social Sciences (VASS), président le 1er CRISEA Research Workshop co-organisé par le Centre EFEO de Hanoi et VASS du 28 au 30 mars à Hanoi. Soixante chercheurs seront réunis. From 22nd to 25th March, Luca Gabbiani participates in the Annual Conference of the Association for Asian Studies 2018, at Washington D. C. There, he will give a talk in the framework of the session he has organised entitled “’Of rules and men' - The Qing imperial institutions and their legal framework”. Paola Calanca participates, from 22nd to 25th March, in the Annual Conference of the Association for Asian Studies 2018, included in the panel Narratives of Pirates: Imperial Identity, History, and Fiction in Early Modern China and Southeast Asia (1550-1750) and speaks on "Xu Hai: One pirate, several lives?". From 23rd to 29th March, Vincent Tournier is on mission in the Universities of Munich and Hamborg (Gemany). He participates, from 23rd to 25th March, in the seminar Rituals for Power; Rituals for Prosperity, organised at the Ludwig-Maximilians-Universität of Munich, in the framework of which he gives a talk entitled “The Ritual Assignment of Merit in Buddhist Inscriptions from the Middle Period"
From 26th to 29th March, he participates in the “working retreat” of the committee of the Indo-Tibetan Lexical Resource, a base of lexicographical information involving several institutions such as Khyentse Centre for Tibetan Buddhist Textual Scholarship of the University of Hamburg. Michela Bussotti, "Les Chinois et leurs voisins : imprimeurs avant Gutenberg", La revue de la Bibliothèque nationale et universitaire de Strasbourg, hors série : Gutenberg 1468-2018, 2018, p. 8-15. Michela Bussotti, "Représenter des 'espaces familiaux' dans les généalogies de Huizhou imprimées sous les Ming (1368-1644) et les Qing (1644-1911)", Etudes chinoises, 36-1, 2017. Pierre-Yves Manguin, "Dialogues between Southeast Asia and India: a necessary reappraisal", in Anna L. Dallapiccola & Anila Verghese (eds. ), India and Southeast Asia: Cultural Discourses, Mumbai, K.C. Kama Oriental Institute, 2017, p. 23-36. Pierre-Yves Manguin, "Transpeninsular routes in the light of new finds in coastal and nautical archaeology", in Wannasarn Noonsuk (ed. ), Peninsular Siam and its neighbourhoods: Essays in memory of Dr. Preecha Noonsuk. Nakhon Si Thammarat: Cultural Council of Nakhon Si Thammarat Province, 2017, p. 47-54. Pierre Harry presents the new EFEO publications at the salon of the Association for Asian Studies from 22nd to 25th March at Washington D.C..
Clément Froehlicher and Antony Boussemart are in Washington D. C. from 20th to 25th March to participate in the annual conference of the AAS (Association for Asian Studies) and in professional committees CEAL (Council of East Asian Libraries) and CORMOSEA (Council of Research Materials on Southeast Asia). - seminar "Curiosité savante, culture politique et sociabilité lettrée dans le Mengxi bitan de Shen Gua (1031-1095)", with Valérie Lavoix (Inalco). The focus this year will be on the reading and analysis of notes on Belles Lettres, ingenuity (Joël Brenier), astronomy (Christopher Cullen), strange events (Catherine Despeux) and the materia medica (Frédéric Obringer). From 17th November 2017 to 16th March 2018, 1st and 3rd Fridays of the month from 14h to 17h,1st basement, building A, room 24 (AS1_24), 54 bd Raspail 75006 Paris. - seminar "Identités et conduites lettrées dans la Chine des Song (960-1279): les formes de l'écriture", in collaboration with Christian Lamouroux (EHESS) and Stéphane Feuillas (université Paris Diderot). This year the focus will be on the reading and analysis of the writings-in-exile of Wang Yucheng (954-1001). On 6th and 20th November, 4th and 18th December 2017, 8th and 22nd January, 5h and 19th February 2018, Mondays from 13h to 16h, building. A, 6th floor, room 51 (room A06_51), 54 bd Raspail 75006 Paris. - group seminar EHESS-INALCO "Language, history and textual sources of ancient and modern Cambodia" from 9th March to 15th June 2018, Fridays from 10h to 12h, at lNALCO (room 6.11, 65 rue des Grands Moulins 75013 Paris). - seminar EHESS Cultural History of China (15th to 19th century) from 1st February 2018 to 31 May 2018, odd Thursdays 14h to 17h, EHESS (room A07_47), 54 bd Raspail 75006 Paris. - seminar EHESS L'Asie maritime: pouvoirs et gens de mer. From 31st January 2018, Wednesdays from 15h to 17h, EHESS (105 bd. Raspail, room 10), 75006 Paris. - seminar EHESS Histoire sociale, économique et institutionnelle de la Chine moderne (15th-20th century). From 22nd November (see schedule of sessions on the website https://enseignements-2017.ehess.fr/2017/ue/1530//), Wednesday from 14h to 17h EHESS, 54 bd Raspail 75006, Paris. - participates in the EPHE seminar of Charlotte Schmid: Épigraphie et iconographie du monde indien "Dynasties majeures, majestés mineures" (Thursday from 13h to 15h) at the Maison de l'Asie. - seminar EPHE (Master EMAA) in collaboration with Laurianne Bruneau (EPHE) "Histoire et archéologie du Monde Indien" at the Maison de l'Asie (grand salon), Wednesdays from 10h to 13h until 24th January 2018. - seminar of the Laboratoire Histoire et Sources des Mondes Antiques in the framework of the Master Mondes Anciens, first semester, "Regards croisés sur le monde indien, I-Les sources de l'histoire ancienne de l'Inde". From 18th September, Mondays from 16h to 18h, 18 rue Chevreul, Lyon (4th floor). The second semester seminar will be announced in December. - At the EPHE, Master Études asiatiques seminar with Andrea Acri: "Lecture de textes en vieux javanais ". From 28th September, Thursdays from 10h to 12h, Maison de l'Asie, 4th floor room. - Master EPHE Études asiatiques, seminar lecture d'inscriptions sanskrites de l'Inde et de l'Asie du Sud-Est. From 28th September, Thursdays from 15h to 17h, Maison de l'Asie, ground floor room. - "Politique et religion au Tibet" in the framework of the Master Études European and International, contemporary Oriental Asia course, co-created with Institut d'Asie Orientale (CNRS). From 18th September, ENS Lyon and Sciences-Po Lyon. - "Initiation à la recherche sur les cultures et langues bouddhiques du Nord de la Thaïlande et du Laos (second part)", with the collaboration of M. Grégory Kourilsky (associate researcher, The Robert H. N. Ho Family Foundation Program in Buddhist Studies). Course begins 20th February 2018, every Tuesday, 10h30-12h30, at the Maison de l'Asie. - Seminar EPHE Épigraphie et iconographie du monde indien "Dynasties majeures, majestés mineures", in collaboration with Valérie Gillet (EFEO). Following on from the seminars of the two previous years, the year 2017-2018 is structured as an enquiry into the major and minor dynasties of the Tamil country. What is the nature of the control exercised by a major dynasty? And by a minor dynasty? How is the association with a territory shaped? What kind of relationship is sustained between a minor dynasty and a "major" dynasty-s? Do "minor" dynasties maintain links with each other? It is through this selection of questions, and others, that we will explore the sites where several dynasties cross, dynasties whose minor or major status remain to be determined. From 9th November to 7th June, Thursdays from 13 to 15 h, ground floor room, Maison de l'Asie, 22 avenue du Président Wilson, 75016 Paris. Magali An Berthon (doctoral candidate of the Royal College of Art, London) goes to Phnom Penh in the framework of a two-month EFEO allowance EFEO to continue her research on the reconstruction, preservation and transformation of the know-how regarding silk in post-conflict Cambodia (1990-2018). Camille Senepin (in Master 2 at the University of Lyon 2) goes to Hanoi in the framework of a two-month EFEO allowance to study the Tho Mau religion and and its Hâù Bong possession ritual. Béatrice Zani (doctoral candidate in sociology, University Lumière Lyon 2), EFEO fieldwork beneficiary, will carry out a research stay at the Taipei EFEO Centre from 10th to 22nd March 2018. Sophie Biard has begun a four-month post-doctoral research period at Cambodia focused on the provincial collections, their preservation and exposition. Cécile Guillaume-Pey carries out post-doctoral research for 5 months on the phenomenon of inscription and the circulation of writing in the ritual context amongst the Sora and the Meitei (India). Monday 26th March, François Lagirarde (EFEO) speaks on “Épigraphie et religion: le bouddhisme du Nord de la Thaïlande dans les inscriptions anciennes (XIIIe-XVIIe siècle)” from 11h to 12h30. Maison de l'Asie, 22, avenue du Président Wilson, 75116 Paris, Grand salon, 1st floor. 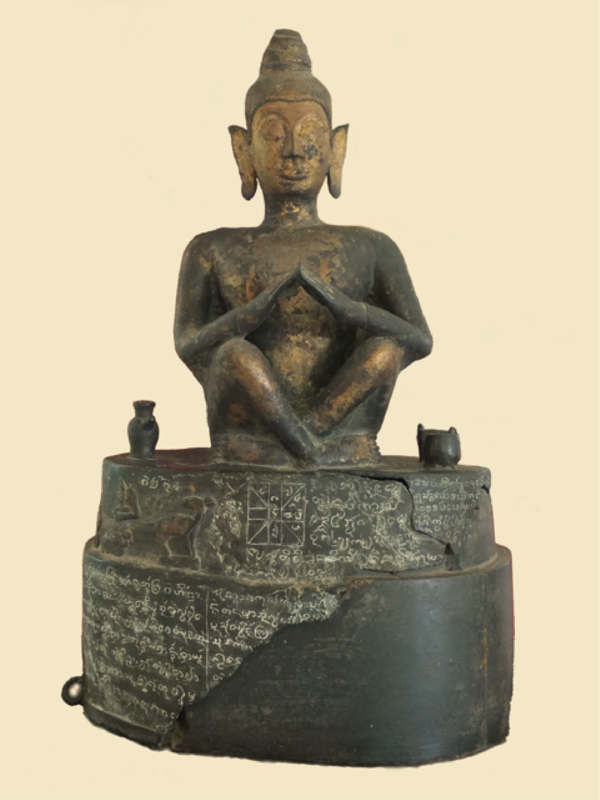 The monumental Thai inscriptions appeared from 13th to 14th century at Sukhothai, directly inspired by models of Khmer and ancient Mons epigraph, in Sanskrit and Pali already present on the territory. The well known stele of Ramkhamhaeng (circa 1290) seems to have immediately established a paradigm of political writing which founds the local dynastic principle and begins the redaction of a “national story” or of an imperial gesture bestowing the highest religious responsibilities on the elite royal families. Hard fact, part fiction? The epigraphy of Sukhothai would not be a paradigm of writing other than for the kingdoms of the South. In the North, the Lanna, who inherit, however, masterfully from Sukhothai, epigraphy readily developed and measured, and pragmatic types of messages that put forward a situation of exchange with many differences between the Palace(s) and the monastic communities. Here, recognised epigraph, encourages and entirely legalises the meshing of spiritual territory with levels of much greater freedom. Epigraphique usage show a regular functional action (gift, economic management, organisation of worship) in the name of a substance to which it refers without discontinuity (canonical citations, vernacular texts, Buddhist “imaginary”). In this sense the epigraphy constructs and reveals Buddhism as a religion. This is even one of the first ways to apprehend its history. This lecture is integrated into the Master seminar “Asies” (EFEO - EHESS - EPHE) whose subject is Buddhism. Sam Darlymple (second year Sanskrit Student at Oxford University) is in Pondicherry from 13th March to 4th April to join regular reading sessions led by Dominic Goodall. Marzenna Czerniak-Drożdżowicz (Jagiellonienne University of Cracow) is leaving after a month at the Pondicherry EFEO Centre working with R. Sathyanarayanan on their critical edition of Śrīraṅgamāhātmya. G. Vijayavenugopal is invited to give two courses entitled “Introductory Course in General Linguistics” and “Comparative and Dravidian Linguistics” to post-graduate and doctoral students of Tamil at the Centre of Indus Research of the Roja Muthiah library at Chennai from 12th to 16th and from 26th to 30th March 2018. S.L.P. Anjaneya Sarma participates in a traditional seminar “Māṇikya śāstri-smāraka-catuśśāstrasadas” at Vijayavada (Andhra Pradesh) 1st March to discuss “Siddhāntaśekharavicāra”. He then participates at Kancipuram from 11th to 13th March in a conference “Srīśrīśrī śaṅkaravijayendra-s¬arasvatīsaṁyamīndrāṇāṁ jayantyutsava-chatuśśāstrasabhā”, where he will speak on “Gati-buddhi-pratyavasānārtha-śabda¬karmā¬karmakāṇām aṇikartā sa ṇau 1-4-52 iti sūtravicāraḥ”. S.A.S. Sarma participates in a three-day national seminar called “Regional Traditions of Sanskrit: Contributions of North Kerala” (Traditions régionales du sanskrit: Contributions du Kerala du Nord) organised by the Sanskrit Department of the University of Calicut, Kerala, from 27th February to 1st March. He gives a presentation entitled ‘The Contribution of ‘North Kerala' to the Tantra of Kerala, with special reference to Svarṇagrāma Vāsudeva”. Professor Cezary Galewicz (Jagiellonienne University of Cracow) spends a week at the Pondicherry Centre to work on his research project on the fluvial temples of central Kerala and to read the Tiruniḻalmālā, a 13th century Malayalam text, with S.A.S. Sarma. On 2nd March, Hugo David goes to Sree Sankaracharya University of Kalady (Kerala), where he gives a lecture (6th C.M. Neelakanthan Endowment Lecture) entitled: “Les commentaires médiévaux sur l’Aitareyāraṇyaka: le cas du Bahvṛcabrāhmaṇopaniṣad-vivaraṇa attribué à Śaṅkara” (The medieval commentaries on the Aitareyāraṇyaka: the case of Bahvṛcabrāhmaṇopaniṣad-vivaraṇa attributed to Śaṅkara). Daniel Perret is at Medan (Sumatra) from 19th to 29th March for a new mission to analyse the furnishings from the excavations of the site of Kota Cina in cooperation with the National Centre of Archaeological Research of Indonesia. This mission is also the occasion to present the exhibition Kota Cina: Silang Budaya Kuno di Selat Malaka (abad 11-14) / Kota Cina: An Ancient Crossroads of the Cultures of the Detroit of Malacca (11th – 14th centuries) at the University of Sumatra-Nord (Medan). Magali Berthon, currently in the second year of a thesis at the department of History of Design at the Royal College of Art of London, is in Cambodia from 11th March to 30th April supported by an EFEO fieldwork scholarship for her research on the “Reconstruction, preservation and transformation of the knowledge of silk in post-conflict Cambodia (1990-2018) “. Sok Soda of the sculpture conservation studio of the Musée National (EFEO) is at Cleveland Museum of Art from 23 March to 4th April for the taking down and return transportation of blocks of sculpted wall lent by the Phnom Penh museum for the exhibition Beyond Angkor: Cambodian Sculpture from Banteay Chhmar. From 7th to 10th March, the EFEO Centre of Siem Reap is showing a selection of photographs of Angkor, from the archives of the École, in the framework of the Semaine française à Siem Reap inaugurated by Mme the Ambassador Eva Nguyen Binh. On 12th and 13th March, participation in the round tables of the Workshop on Developing Research Capacity in Social Sciences and Humanities organised at Siem Reap in the context of a European project of GEReSH-Cam (Governance and Emergence of Human Sciences Research in Cambodia, https://www.geresh-cam.eu, on 12th March, a reception for the opening of the workshop is given at the Siem Reap Centre. From 18th to 24th March, Eric Bourdonneau is in France to be on the jury for the thesis of Gabrielle Abbe (“Le Service des arts cambodgiens mis en place par George Groslier: genèse, histoire et postérité (1917-1945)”, director Hugues Tertrais, Univ. Paris I Panthéon-Sorbonne. From 27th to 30th March, Eric Bourdonneau is invited to New Delhi by the Indira Gandhi National Centre for the Arts, on the occasion of the international conference Angkor Wat: The Monument and the Living Presence. He will give a talk there entitled: "Blossoming Flower-Maidens and Fallen Heroes on the Battlefield. About an exquisite jewel that has much to tell about Angkor Vat". He will stay on to visit the sites of Maharashtra and Karnataka. In the framework of the cycle Histoire, Archéologie et Société (HAS) the subject of which for 2017-2018 is “Le souci du passé: antiquarianismes et pratiques de patrimonialisation en Chine et ailleurs”, Alain Schnapp (Professor Emeritus of Greek archaeology at the Université Paris I, former Director General de l'Institut nationale d'histoire de l'art) gives a lecture 15th March 2018 at 14h at the Institut des beaux-arts de l'Université de Pékin, on the following subject: “Appropriating the Past: Chinese and Western Antiquarianism”. This programme is jointly organised with the Max Weber Foundation in the framework of the new European Research Centre of Chinese Studies (Beijing). See the ERCCS blog: https://erccs.hypotheses.org/. The EFEO Centre of Peking celebrates, on 19th March, the 20th anniversary of its creation. The event takes place for the first time (13h30-16h) at the Institute of History of Natural Sciences, a partner of the Centre since its opening, with a two-person lecture by Marianne Bujard (EPHE), former head of the Centre, and Ju Xi, anthropologist at Beijing Normal University. The conference is to be given in French and Chinese after a talk by the head of the Centre, Guillaume Dutournier, which will evoke the realisations of researchers who have shared the life of the Centre for two decades. The listeners are then bidden to a reception in the premises of the European Research Centre of Chinese Studies, in the presence of the Director of the EFEO, Christophe Marquet, of Chinese colleagues, of representatives of the Max Weber Foundation and of the French Ambassador. The Taipei Centre is launching a Facebook page to publicise its activities: https://www.facebook.com/efeo.taipei. Frank Muyard gives the course “Histoire du monde austronésien francophone”, National Central University, Taoyuan, from 23rd February. Alain Thote (EPHE, PSL) is in Taiwan from 4th to 9th March at the invitation of the EFEO. He will give three lectures, Monday 5th March on “Artistic Designs and Bronze Inlay Techniques of the Late Zhou Period: Invention and Interaction”, organised in collaboration with the National Palace Museum (Gugong); Tuesday 6th March on “Why were Manuscripts Deposited in Tombs of the Late Zhou period and Early Han Dynasty?”, in collaboration with The Centre of Research on Ancient Civilisations, Institute of History and Philology, Academia Sinica; and Thursday 8th March on “The Sanxingdui Civilization and its Heritage: Preliminary Investigations” organised in collaboration with the Institute of Archaeology, National University Cheng-Kung, Tainan. Béatrice Zani (doctoral candidate in sociology, Université Lumière Lyon 2), EFEO fieldwork grant beneficiary, carries out research during a stay at the Taipei EFEO Centre from 10th to 22nd March 2018. Her research project is called “Carrières urbaines et professionnelles d'émigrantes de la Chine à Taïwan: solidarités et résistances en contexte globalise”. Véronique Degroot (EFEO Jakarta) is in Taiwan from 25th to 30th March at the invitation of the Taipei EFEO Centre to give three lectures: Monday 26th March on “Structure of the Territory in Ancient Central Java: An Archaeological Perspective” organised in collaboration with the Centre for Research on the archaeology of Taiwan and Sout-East Asia, of the Institute of Histoire and Philology, Academia Sinica; Tuesday 27th March on “Towards an Archaeology of Religion in Ancient Java: The Ritual Deposits from Candi Kimpulan”, organised jointly by the EFEO and the Institute of Archaeology of the National University Cheng Kung, at Tainan; and Wednesday 28th March on “Small Things Matter: Archaeological Survey of Hindu-Buddhist Sites and Artefacts along the North Coast of Central Java”, organised with the South Branch of the National Palace Museum, Chiayi. On 22nd March, the 16th Seoul Colloquium on Korean Studies, organised by the EFEO Centre of Seoul in collaboration with the Seoul Branch of the Royal Asiatic Society and the Asiatic Research Institute of Korea University, is facilitated by Yim Dongwoo (doctoral candidate of the Royal Melbourne Institute of Technology and assistant at Hongik University Graduate School of Architecture and Urban Design) on the subject of Unprecedented Pyongyang. This conference is the first of a cycle organised by the EFEO Centre and devoted to the study of North Korean towns in the framework of the ANR EFEO/EHESS/Leiden University “CITY-NKOR: Ville, architecture et urbanisme en Corée du Nord". On 3rd March, François Lachaud gives a talk on “Georges Ferdinand Bigot et la caricature japonaise moderne” at the Maison Franco-Japonaise in the framework of the symposium Meiji par Bigot - peintre et caricaturiste organised on the occasion of the exhibition consecrated to Georges Ferdinand Bigot which is held at the Maison Franco-Japonaise from 3rd to 21st March. In the framework of the symposium Corps et Message organised by the department of Japanese Studies at the University of Stransbourg and the Opéra du Rhin, François Lachaud gives a talk entitled “De Montmartre à Edo: Nagai Kafū (1879-1959) et la poétique de la ville“ 23rd March. On Wednesday 14th March at 18h, at the Kyoto EFEO Centre, in the framework of the Kyoto Lectures, Lúcio de Sousa (University of Foreign Languages,Tokyo) gives a lecture: “The Jesuits and Slavery in Early Modern Japan: the system of "permits". Martin Nogueira Ramos is in Rome from 18th to 27th March to consult the Archivum Romanum Societatis Iesu, of the Archivio storico de Propaganda Fide and of lArchivio della Congregazione per la Dottrina della Fede. He will consult mostly documents bearing upon the Evangelism of several fiefdoms of the Isle Kyûshû (16th - beginning of 17th c.). Martin Nogueira Ramos participates in Les nicodémismes dans l'Europe méridionale moderne: Pratiques de simulation et de dissimulation religieuse (Universities Paul-Valéry-Montpellier and Bordeaux-Montaigne) which is held at the Cervantes Institute of Bordeaux 28th and 29th March. In the framework of the session "Sensibilités religieuses et dissimulation", il fera une présentation qui s'intitule: “Renier sa foi sans perdre son âme. Les catholiques japonais au début de la proscription (17th century). Si vous souhaitez recevoir (ou ne plus recevoir) l’Agenda de l’EFEO, ou si vous rencontrez des anomalies dans l’affichage merci d’en informer Isabelle Poujol : isabelle.poujol@efeo.net.